The SDSB Luminites Association is a nonprofit and non-political organisation, run by a governing body, the Executive Committee, which is elected by the association and consists of members of the association. The association was formed with the aim to work for the welfare of its members and to play a leading role in enhancing the student experience and worldwide prestige of LUMS in general and Suleman Dawood School of Business (SDSB) and its alumni in particular. One of the most important tasks of the association is to bring its members together periodically for networking, intellectual development and resource generation. For this purpose the organisation arranges informal get-togethers, courses and lectures by recognised national and international scholars. The association members also work to generate resources to meet the objectives of LUMS and SDSB in particular. Job placements, Mentorship programmes and other features are planned for phase 2. ‘myLUMS’ was officially launched on December 29, 2018, at the SDSB Luminites Association Alumni Reunion. 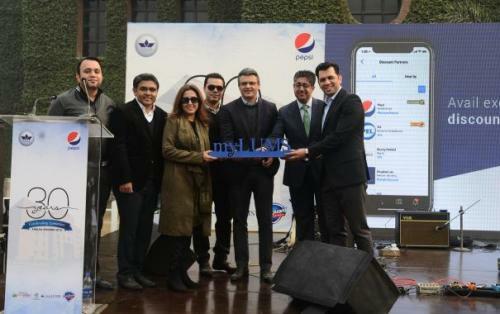 The App was handed over by the Association to Nuzhat Kamran, Director Office of Advancement, to increase its scope and to include alumni from all Schools at LUMS. The App is under further development and will be available to every LUMS graduate in the months to come. It is available for both Android and iOS. Technological revolutions are part of the ever-changing, dynamic landscape of the business world. Hence, it is necessary to keep abreast of the latest developments and innovations in technology. On Friday, January 11, the SDSB Luminites Association, along with industry partner P@sha, welcomed Affan Dar to LUMS to discuss the latest developments taking place in the Internet of Things (IoT) landscape. The session was well attended by LUMS students, alumni, faculty and industry professionals. Mr. Dar graduated from Ghulam Ishaq Khan Institute of Engineering Sciences and Technology (GIKI) as an Electrical Engineer in 1998, and completed his Masters in Computer Science from the University of Washington in 2012. He has worked with Microsoft for the past 18 years and currently, is a Group Engineer Manager, managing the Azure IoT platform. He holds several patents in the field of IoT and Edge Devices. Majid Munir, President of the SDSB Luminites Association, introduced the speaker before a packed auditorium. During the presentation Mr. Dar talked about how IoT is a business revolution enabled by technology rather than the other way around. He shared case studies on how IoT is impacting agriculture, digital signage, real estate management, and various other industries. Mr. Dar discussed examples such as agricultural companies using IoT devices to monitor crop infections and precision irrigation, digital signage companies using IoT for real time maintenance or content management, real estate management companies using IoT for managing shared spaces or energy efficiencies, and the industry using IoT for improving predictive maintenance to improve uptime, lower waste, and improve productivity. IoT applications already being developed in Pakistan were also discussed. The talk concluded with a Q&A session where students, professionals and faculty got a chance to directly interact with Mr. Dar. This event was part of the ‘Digital Disruptions’ initiative taken by the SDSB Luminites Association where industry experts will be invited to speak on different topics of interest for the business community and academia. Reunions are always nostalgic and exciting affairs, add to that an important milestone and the day is bound to be extremely special. 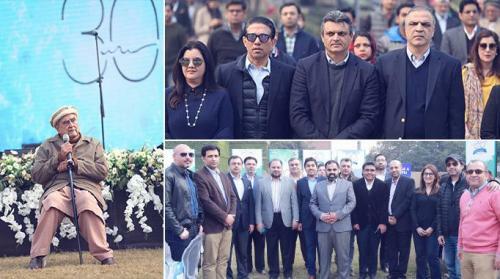 The Suleman Dawood School of Business (SDSB) Luminites Association’s Annual Reunion, held this Saturday, December 29, 2018, was momentous as it marked SDSB alumni’s three-decade long journey with LUMS. The alumni gathered at the University’s Library Lawn on the beautiful sunny day to meet up with fellow Luminites. The event was hosted by graduates, Anwar Kabir and Sidra Faiz, VP and Council Member of the SDSB Luminites Association, respectively. The reunion commenced with Majid Munir, President SDSB Luminites Association sharing the initiatives that the Association has pioneered, focusing on giving back to the University and the communtiy at large. Nuzhat Kamran, Director, Office of Advancement later emphasised how alumni support is key for the development of the University. Ahsan Rehman Sheikh, Association Board Member, introduced ‘myLUMS’, a mobile app, he has developed. The app will allow SDSB alumni to search and connect with each other. It will also later be used to connect alumni from the other Schools of LUMS. The two keynote speakers for the afternoon, Ali Naqvi, CEO Aletheia Capital, and Furqan Syed, VP and GM Pakistan at PepsiCo., both LUMS alumni shared personal anecdotes of their time at LUMS and talked about how the University has been at the forefront of thought leadership in the country. Mr. Syed, who was also awarded the Pride of LUMS Award appreciated how the University has grown through the years. “Today LUMS is not just about an MBA; it now offers a wide choice of programmes through its five Schools so it has evolved tremendously. It is by far the best institution that one can join in Pakistan and is at par with global standards. I feel so proud to be associated with this institute for 30 years,” he said. Soon after, the esteemed founder of LUMS, Syed Babar Ali, was invited to say a few words. He said that the LUMS brand owes its success to the graduates of the first four batches that went into the job market and set a standard that the coming graduates have maintained. Twenty-three distinguished alumni from all walks of life who have done exceptional work in their respective fields were also honoured by the SDSB Luminites Association. No event is complete without great food. The Association treated the alumni to scrumptious desi cuisine and Kashmiri chai, over which the alumni and faculty had hearty conversations and rekindled old friendships. The afternoon gathering continued with yet another treat as ‘Xarb’, a popular band wowed everyone with their soulful performance. Kamran Majeed, BSc Accounting and Finance 2012 shared that it was great coming over to the campus and a pleasure connecting with the LUMS community. 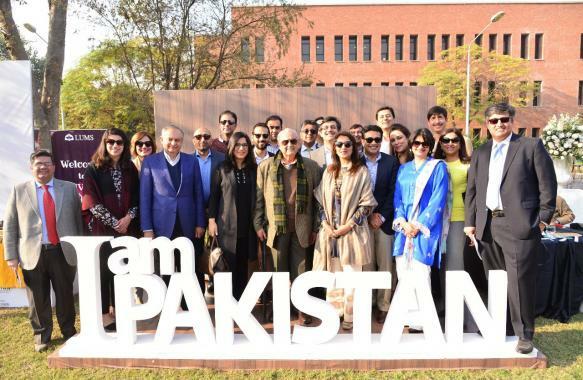 It was an afternoon of reminiscing, reconnecting and reflecting on the old times; it was clear that even though everyone had travelled far in their personal and professional journeys, LUMS was still an integral part of their lives. 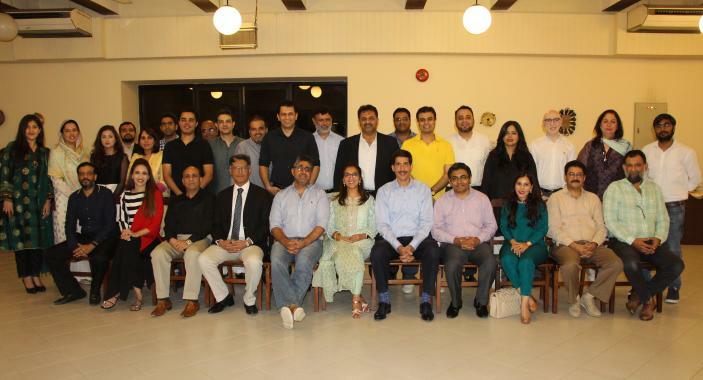 The LUMS Suleman Dawood School of Business (SDSB) Luminites Association organised a welcome dinner for the new elected Board of Directors and Council Members on Tuesday, June 26, 2018 at the Executive Dining Hall at LUMS. The event was attended by the outgoing board members and the new elected board providing an opportunity to both connect and celebrate the achievements of the outgoing board members. The event was also attended by the Vice Chancellor, Prof. Dr. S. Sohail H. Naqvi, Dean of SDSB, Dr. Jawad Syed, the Election Committee, and members of the Office of SDSB External Relations and the Office of Alumni Relations. The evening began with Dr. Naqvi thanking the SDSB Luminites Association for their tremendous work towards helping build connectivity and communication with the SDSB alumni through their activities. He also talked about the alumni being an integral part of LUMS and its future. Fatima Asad-Said, former President of SDSB Luminites Association, spoke about various activities including developing the concept paper for the Association, conducting mentorship and think tank brainstorming sessions, delivering branding-related activities and app developments, designing CSR initiative organisations, holding sponsorship drives, hosting the annual alumni reunion and LUMS meet-ups, and Leaders at LUMS sessions. She also addressed the finalized, well-articulated, and clearer MOA and set of rules for the Association with the purpose of continuity and institutionalisation as one of the top priorities. Dr. Jawad Syed congratulated the outgoing board for their hard work and welcomed the new board. He emphasised on working together as a team to take the University to newer heights. The Board had a great time socializing with each other over a lovely dinner. The evening came to an end with the new board looking to take charge of the Association and their new roles. The new Board of Directors and Council Members also made plans to hold meetings to develop the plans for their tenure. The enthusiasm and excitement could be felt in the air as over 300 alumni and their families entered the beautifully decorated lawn where the Suleman Dawood School of Business (SDSB) Annual Reunion was held on Saturday, December 30, 2017. After an interactive meet and greet period, Ali Imam Naqvi, MBA 2007 opened the event by introducing the founders of LUMS and called upon stage the President of the SDSB Luminites Association, Fatima Asad-Said, MBA 1997. Fatima began her speech by thanking all the people who helped make the event possible by taking out time from their busy schedules and making an effort to make the reunion a memorable experience. As she took her leave, Fatima called upon stage the founder of LUMS, Syed Babar Ali, who shared his extraordinary journey of starting LUMS as a humble institution and the incredible pride he feels to see where it stands today, especially crediting the business school for bringing in rigour and good ethics that contribute to the reputation that LUMS has today. “It is now you people, who must continue this journey and be the future of a rising Pakistan. Stay strong, work hard and you will be successful,” he said. LUMS Rector Abdul Razak Dawood also took to the stage and introduced the theme of the event, Rising Pakistan. He thanked the Alumni Relations Office for playing a key role in keeping this relationship between alumni and the University strong, and talked about how the SDSB teaches and encourages their students to excel. The husband wife duo, both work with The Citizen’s Foundation (TCF) and have contributed to the social development of Pakistan. Zia shared stories of TCF and their journey of educating poor children and providing them with opportunities that otherwise would not be available to them. They also shared the belief that Pakistanis should unite and change for the positive. Their story was inspiring for all those present at the event. LUMS Vice Chancellor, Prof. Dr. S. Sohail H. Naqvi, then addressed the gathering and shared how the institution has grown and flourished since its establishment. Aside from listening to the engaging speeches, the alumni spent the afternoon enjoying appetizers, which included delicious samosas, bhel puri and gol gappay, reconnecting with old friends, and taking fun pictures at the lively photo booth. After the sumptuous lunch, the alumni then wrapped up the afternoon’s festivities by enjoying a fantastic performance by popular band, Khumariyan. The SDSB reunion was a collaborative effort, reflective of the good that comes when the LUMS family works together towards building the community and the institution through strong teamwork and a spirit of generosity, tolerance and compassion. The sponsors for this event were Pepsi, Berger Paints, Abacus Consulting, Hum TV, HKB, Digital Globe Services (DGS), Capventures, and Kinetic. The event was organised by Activemedia, an event management company established by LUMS alumnus Saad Khan, MBA 1999.